It is probably a safe bet that readers at 10,000 Birds relish field guides irrespective of their subject. Birdie books will obviously take precedence, but a well written, lavishly illustrated guide is a thing of beauty whatever the discipline. 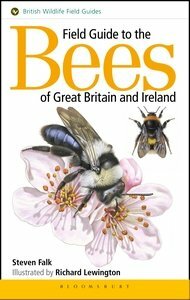 Steve Falk gives authoritative accounts and Richard Lewington provides the detailed illustrations in the Field Guide to the Bees of Great Britain and Ireland (a British Wildlife Guide published by Bloomsbury). Backed up by hundreds of excellent photographs, they have brought to life the bees of the British Isles. If this was a bird guide, we would all have one already. Although the guide describes species from a limited range, the importance of bees throughout the world cannot be overstated. Wild bee species are vital to agriculture and a Cornell University study concluded that “insect pollinators contributed $29 billion to US farm income in 2010″ and are “integral to food security in the United States”(quotes from response to RFI). A book mark was very useful to make the glossary quickly accessible. As a newcomer to the world of bees and social insects, a lot of the terminology was alien to me. I could have coped with a bit of patronising prose to ease me in gently, but the book is written to fill higher expectations than My First Book of Bugs. I was engaged from the very first paragraph. The preface opened my eyes to the wonderful world of bees and had me gagging for answers. Did you know for example that some species of bee are cleptoparasites, exploiting the nests of other species for their own eggs. The term “Cuckoo bees” does not fully describe the widely various methods of their subterfuge, but it gives a concise picture of their parenting style. The format of the guide will be instantly familiar. An extensive introduction draws the reader into the hymenopterists’s world (the more frivolous amongst us may have hoped that a bee fancier would have used the label “beer”, but as already alluded, this is a serious book) describing life-cycle, classification (there is little comfort here for birders hoping to escape the constant splitting and lumping of bird classification) and behaviour. Most fascinating is the explanation of the predetermination of roles within social bee societies. The workings of a bee colony put me in mind of George R R Martin’s A Game of Thrones. Finding that certain species have a “Dark Queen” only served to fuel the comparison. The species accounts which cover the 275 bee species found here, give distribution maps, flight season, nesting habits, preferred flowers and habitats as well as detailed photographs and physical descriptions. 20 plates of illustrations by Richard Lewington deconstruct the species to aid identification and dichotomous keys use couplets to distinguish between genera and ultimately identify to species level. A magnifying glass or even a microscope will enhance the experience and close up, detailed photos and illustrations are included to reward the most determinedly curious. I was initially surprised to find that only a few paragraphs were devoted to bee conservation. However, the preceding pages encourage the reader to record sightings and submit data to www.bwars.com (eBee if you like) and there is suggested further reading and enthusiast websites to feed the curiosity of the nascent bee conservationist. Conservation walks hand in hand with involvement. The book was published at the beginning of November, and I might have tucked it away until the warmer weather brings a buzz, but the author stressed the importance of gardens and how we can make habitats for bees and other pollinating insects so close to home. So as winter approaches, I am planning my planting scheme to ensure constant supplies of flowers and making sure that compost heaps, rockeries and untidy corners are left undisturbed through the cold months. There is general consensus, reaching to governmental level across the world, that pollinators essential to agriculture are susceptible to insecticides, habitat loss, alien invaders and disease. It is also agreed that we must act to ensure their continued success. Suburban gardens have become very important to bees and we are all encouraged to set aside a small part of our gardens to attract insects. Wildflower meadows, ponds and log piles will give our vital pollinators a continuous supply of pollen, prey and overwintering quarters. As an introduction to the world of bees, Steve Falk’s book is captivating and fascinating. As a guide to identification, I will let you know in the spring when the air is a-buzz. I feel sure that the dichotomous keys and Richard Lewington’s plates will combine with the detailed photos to make identification as straightforward as possible. May I commend this book to all 10,000 Birds readers. Those with a warm month trip to Great Britain and Ireland will find immediate relevance, but even if you have no intention of visiting the isles, this field guide still contains enough significant information to be applicable beyond its intended range. The guide’s author, Steve Falk, is a specialist at www.buglife.org.uk and Richard Lewington is one of Europe’s leading natural history illustrators.